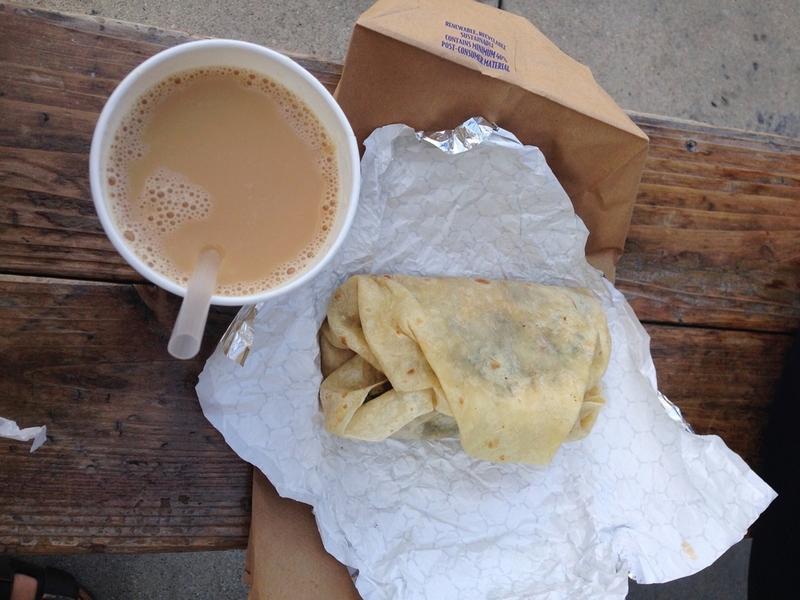 On our way to Griffith Park we aimed to grab breakfast burritos from Tacos Villa Corona in Atwater. They only serve take-out, and while Macey has had a burrito there before, I haven't and we wanted to check it out. It was a crowd scene when we rolled up, and with a 45 minute wait before they would take another order, there was no way we could roast the dogs in the van for that long, so we did a U-turn and stopped in at Hugo's Tacos, just a block away. They also only run take out, but there are picnic tables and benches out front, as well as parking. The veg and vegan options were super impressive, and it was really inexpensive. Our meals were gigantic and we struggled to finish. Stand out item: Hugo's advertises a sorghum replacement for rice, and lists their opinions as to why it is an awesome option: similar nutritional structure as quinoa, requires much less water than rice to farm, rich in antioxidants, and helps to repair depleted soil where grown, among other benefits for health and ecology. You can get a free sample to see if you like it, and we love an idea. Today was HOT. We wore ourselves and the dogs out at Griffith Park, which is a shockingly short hop from Silver Lake/Junction, and is an enormous expanse of green space (and dirt space, and dust space), with dozens of trails for runners and dog walks and even horses. After we recovered a bit at home, we spent our last afternoon poking around Hillhurst and Los Feliz. We met up with the pals for supper at El Compadre in Echo Park, which is known for their flaming margaritas. This is the kind of place with quilted leather booth upholstery and oil paintings of adobe vessels and it's channeling a deep 70's thing, but it rules and feels fun and lightly fancy. It's also super loud and full of people, including a mariachi band. This is a menu which only has a couple of token veg items, and you have to search for them, but the ambiance is cool and the drinks are great. We visited with our pals for one last night and listened to them extol the virtues of their adopted home in Los Angeles. We love that they love it here, and we can't imagine feeling any other way about it. We are so lucky we got to fake it for a week.